Made of Ceramic with a Non-Porous Glossy Finish in Key Lime and White. The perfect vessel for cooking up your favorite oven cooked meals, you'll love having this casserole dish handy in the kitchen! It not only looks beautiful, but it's ideal for a variety of dishes and makes your presentation that much classier. 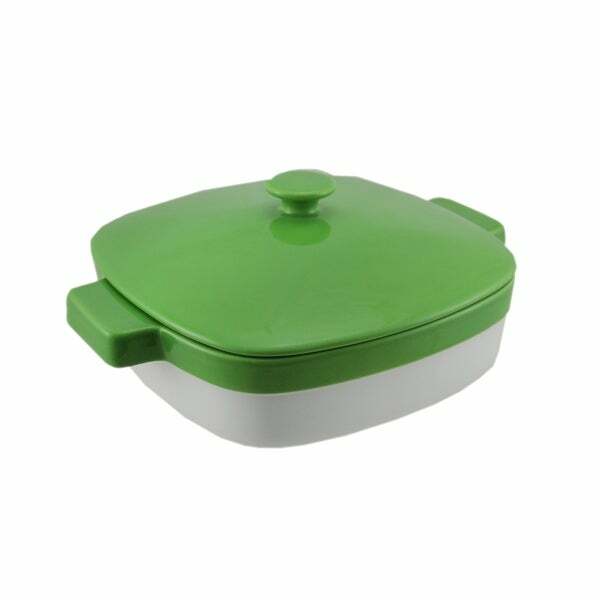 It's made of ceramic with a glossy key lime green and white non-porous coating, and it heats quickly and distributes the heat evenly for perfectly cooked dishes. The lid retains heat and traps in moisture, keeping your dish hot and tender. Since it's commercial quality, it's durable enough to withstand most any cooking situation, from casual dinners to formal parties, and can go from the oven to the table with ease. This 10.75 inch long, 8.75 inch wide, 2 inch deep baking dish holds 1.9 quarts and is oven safe up to 500 degrees Fahrenheit. It's also microwave and dishwasher safe, making clean up a breeze!